This is the version of Grape and Cable that is referred to as Thumbprint. That's what the indentations around the base are called. Sets of one large bowl and 6 small ones are called berry sets. 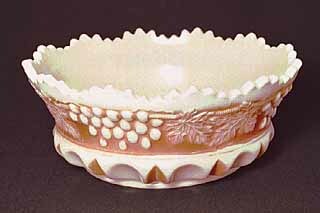 This is a large berry bowl in custard with nutmeg staining and is pearlized. That means it has a light, transparent iridescence. It sold in 1998 for $325.